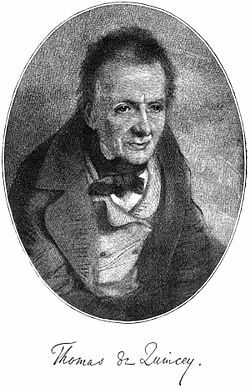 Thomas Penson De Quincey (August 15, 1785 – December 8, 1859) was an English essayist and intellectual. For if once a man indulges himself in murder, very soon he comes to think little of robbing; and from robbing he comes next to drinking and Sabbath-breaking, and from that to incivility and procrastination. Once begin [sic] upon this downward path, you never know where you are to stop. Many a man has dated his ruin from some murder or other that perhaps he thought little of at the time. "A Second Paper on Murder Considered as One of the Fine Arts" (1839). Flowers … that are so pathetic in their beauty, frail as the clouds, and in their colouring as gorgeous as the heavens, had through thousands of years been the heritage of children—honoured as the jewellery of God only by them—when suddenly the voice of Christianity, counter-signing the voice of infancy, raised them to a grandeur transcending the Hebrew throne, although founded by God himself, and pronounced Solomon in all his glory not to be arrayed like one of these. Pt. II, Recalling the day in 1804 when he first took opium. Everlasting farewells! and again, and yet again reverberated—everlasting farewells! Tea, though ridiculed by those who are naturally coarse in their nervous sensibilities … will always be the favourite beverage of the intellectual. This page was last edited on 27 November 2018, at 13:36.